“Geographically, the Slocan Valley is a slender, blue-gold arc of water, pastures, granite, and trees lying in the western shadow of the Selkirk Mountains, in the heart of the southern interior of British Columbia. “It is not a particularly large valley – barely a hundred kilometres long, if one counts only the lake and river that it shelters, and five or so kilometres wide at its broadest plateau. The Valhalla Range of mountains forms the valley’s steep and forbidding western boundary. Its eastern boundary is shaped by the lesser slopes of the Slocan Range; smaller, but no less gentle. “The lake pours southward into the Slocan River at the point where the valley flattens itself out once again into a narrow plateau, barley a kilometre wide…it’s a gentle river for most of its length, chuckling quietly in a series of shallow loops to its union with the Kootenay River near Shoreacres”. –Excerpt from Katherine Gordon’s book The Slocan: Portrait of a Valley (Sono Nis Press, 2004). 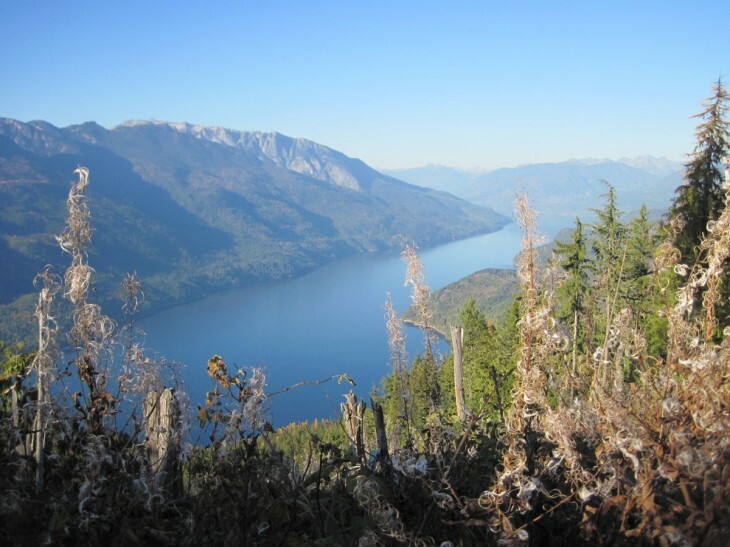 Like many other mountainous and resource rich areas of British Columbia, the Geography and the environment of the Slocan Valley have shaped our present and past. The Slocan Valley is part of the 400km long Kootenay Arc, a belt of sedimentary, volcanic and metamorphic rock. Its mountains, formed during the Jurassic Period some 200 million years ago are rich in silver-bearing galena. The quest for this Galena sparked the mining rush of the late 1800s, early 1900s. As well, the harvesting of timber in the rich forests has been a mainstay of the valley economy. While the north end of the valley saw a mining boom, the south end was prime for settlement. First Nations recognised this and built camps and burial grounds in the south part of Vallican, and settling pioneers worked the fertile valley bottom.